Reddit photo of falcons on a plane. 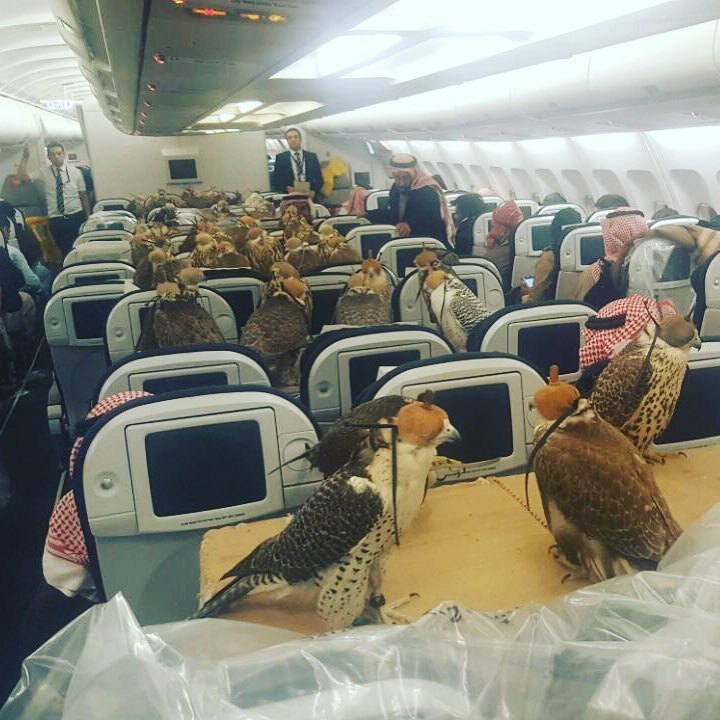 (by the Times of Israel staff) – A photograph of 80 falcons belonging to a Saudi prince flying on a plane, each with an individual seats, became an internet sensation after it was posted on Reddit. The image of the flight with the hooded birds occupying a large section of the plane was taken by the pilot and shared by Reddit user lensoo. Although having so many birds on a plane is fairly unusual, several airlines serving the Gulf States permit passengers to bring falcons aboard with them, including Etihad Airways, Emirates, Qatar Airways and Royal Jordanian Airlines. Noted the Mashable website, “One Redditor points out that this flight probably isn’t Qatar economy class because its policy states that only six falcons are permitted in economy class at a time.” Indeed, Qatar Airways said it had established that the flight was not one of Qatar Airways’, saying that the cabin interior and crew uniforms are incorrect. According to its website, Qatar Airlines allows passengers to bring “one falcon on board the Economy Class passenger cabin of an aircraft, and a maximum of six falcons are permitted within the Economy Class cabin of an aircraft (country regulations may apply).” It even has a page of rates for transporting falcons across the region. Lufthansa has special stands for first class passengers to put their falcons on during flight. The United Arab Emirates has issued passports for falcons since 2002 and has issued tens of thousands of travel documents for the birds. Falconry is an ancient and important part of the Arab heritage and culture and is very popular in the Gulf States. There are two breeding farms in the Emirates, as well as those in Qatar and Saudi Arabia, and Abu Dhabi has the largest falcon hospital in the world. It is estimated that there are approximately 3,000 birds used for falconry in the Arabian Peninsula. (by Nick Squires, London’s Daily Telegraph) – A Roman amphitheatre in the Italian city of Verona is to be covered with a giant tarpaulin to protect opera goers – and the ancient monument itself – from bad weather. A rendering of the project, showing how the giant membrane will look when it covers the amphitheatre in Verona. The tender to build the retractable membrane has been won by a partnership of German engineering and architecture companies, it was announced on Tuesday. The amphitheatre, which is remarkably well-preserved, is one of the world’s great venues for concerts and operas. When not in use, the extendable membrane will fold up into a space on top of the centuries-old arena and will be all but invisible from the ground. The project has been controversial because of fears about the impact on the arena, one of the largest Roman amphitheatres in the world. 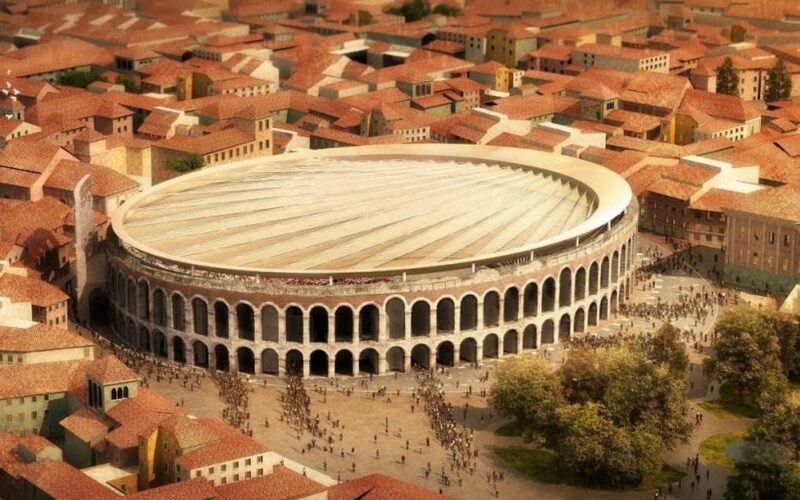 But Flavio Tosi, the mayor of Verona, said the cover was needed in order to protect the arena from the elements. “The main enemy is the rain. It filters down (into the structure) and causes collapses. Just look at what happened at Pompeii,” he said, in reference to a section of wall that collapsed in the ancient Roman city, south of Naples, last week. The project, which will cost 13.5 million euros, will be carried out by the German companies Schlaich Bergermann & Partner and Gerkan Marg & Partners. Their project was chosen from nearly 90 proposals put forward by firms from around the world, including companies in Britain, the US, Switzerland and Japan. If approved by the cultural ministry in Rome, the membrane should be in place within three years, the mayor said. Part of the financing for the project will come from Calzedonia, an Italian fashion company that sells socks, underwear and swimwear. The amphitheatre was built in the 1st century AD and survived an earthquake that struck Verona in the 12th-century.